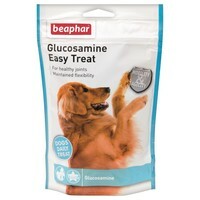 Beaphar Joint Glucosamine Easy Treats are delicious, meaty treats, which have been developed to administer valuable nutrients that your dog needs in a fun and easy method. The treats contain Glucosamine, which taken regularly help with the development and maintenance of healthy tendons, joints and connective tissues. Chondroitin – Improves joint function and gives the joint its shock absorbing properties. Glucosamine – Provides the joints with the building blocks needed to repair damage caused by wear and tear. Green Lipped Mussel – A rich, natural source of Glucosamine and Chondroitin, which helps to regenerate and maintain healthy cartilage. The treats are suitable for all dogs of any age or breed.